In the Multiline Ultimate Assembler plugin for OllyDbg, I use an editor component called RAEdit, written by KetilO in 32-bit x86 assembly. It’s a great component, lightweight and simple to use. Finding an alternative editor component. Using a hack, e.g. running the editor window as a separate 32-bit process. I looked for an alternative, but didn’t find a decent one. Also, I didn’t like the second option, so I’ve decided to port RAEdit. But how do I port an assembly codebase from 32-bit to 64-bit? I’m not familiar with MASM syntax, which the codebase uses. Perhaps it was possible to port the codebase to 64-bit MASM using macros and such. But I came up with a more creative idea: to port it to C first! After all, C is considered by some as a portable assembly. The code uses MASM macros such as .if/.while extensively, which can be easily translated to C. Most assembly commands can be translated to C as well. I had to manually change some of the exotic stuff (such as usage of the CARRY flag), but most of the code was ready for automatic translation. Then, I wrote a script which uses regular expression search/replace to translate every line of assembly to C. The initial result can be seen here. After some tweaking, I could get the code to compile. Due to the fact that there’s no type correctness in assembly, GCC displayed more than 1,000 warnings, most of which complain about incompatibility of types. I was actually surprised that it was able to compile. Obviously, the code didn’t work right away. I had to fix a couple of things manually, but after some tweaking, it actually worked! And after some more tweaks for 64-bit portability (mainly adjusting pointer vs integer types and pointer size constants), the compiled 64-bit library worked as well! Posted in Programming at August 20th, 2014. 3 Comments. MinHook is a Windows API hooking library originally written by Tsuda Kageyu. It’s probably the best free WinAPI library out there which supports both x86 and x64. But it’s not perfect, and didn’t completely fit my needs, so I created a fork on GitHub which addresses some of its limitations. Below you’ll see how the fork improves upon the original MinHook library. Posted in Programming at September 30th, 2013. 6 Comments. When googling for a command-line screenshot maker, all I found was a bloated 3 MB tool and this nifty piece of code. Perhaps it’s gonna be useful to others, so I’m releasing it. 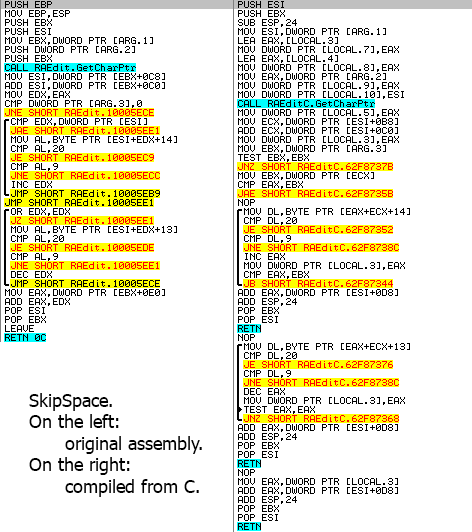 The code and a compiled binary are attached. Posted in Programming at November 16th, 2009. 8 Comments. Here’s my rewrite of the Custom Buffer-Manipulation Routines by Piotr Mintus. Optimized for and works on 32-bit and 64-bit environments. Posted in Programming at October 12th, 2009. No Comments.